Lausanne, Switzerland, October 26, 2015 - Historically, Italy has dominated the FIVB Volleyball Men's Club World Championship, winning eight of the ten titles consecutively since the inaugural edition in 1989 in Parma. It all started in 1989 at Parma's PalaRaschi, when the local club of Maxicono defeated the Soviet Union's CSKA Moscow 3-1 (12-15, 16-14, 16-14, 15-12) in the final to claim the first official world club trophy. Brazil's Pirelli Santo Andre had previously won 'experimental' world club tournaments in 1983 and 1984 and did eventually win an official medal when they beat Banespa Sao Paulo 3-2 (6-15, 13-15, 15-7, 15-5, 16-14) in an all-Brazil bronze medal match in 1989. 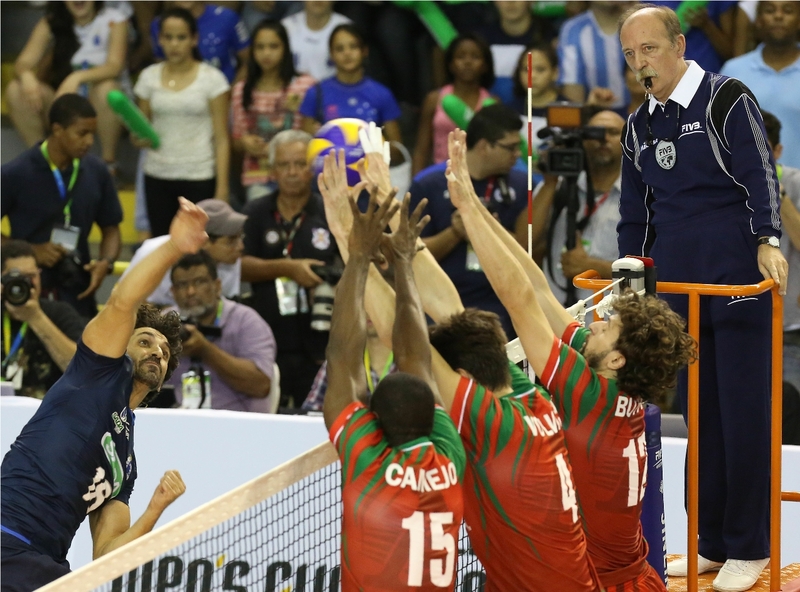 The Italian gold run, however, went uninterrupted from 1989 to 2013, when Sada Cruzeiro of Contagem, a suburb of Belo Horizonte, defeated Russia's Lokomotiv Novosibirsk 3-0 (25-20, 25-19, 25-20) in the final. Sada Cruzeiro's Filippe Ferraz tries to penetrate the triple block of Lokomotiv Novosibirsk's Oreol Camejo, Artem Volvich and Alexander Butko in the 2013 final. Trentino of Trento in northern Italy, who had won four straight gold medals previously, were knocked out by the Russians in the semifinals 3-1 (25-27 25-21, 26-24, 25-23), before bouncing back to take bronze with a 3-1 (25-22, 22-25, 25-21, 25-19) win over Argentina's UPCN San Juan. Trentino dropped even lower to 5th place in 2014 - the first time in the history of the event that neither an Italian nor a Brazilian team made it on to the podium. In a new age for volleyball, it was Belgorie Belgorod who travelled last year from the heart of Siberia to the tropics of Minas Gerais, where they defeated Qatar's Al-Rayyan 3-1 (16-25, 25-21, 25-21, 25-15) in the final at the iconic Mineirinho. 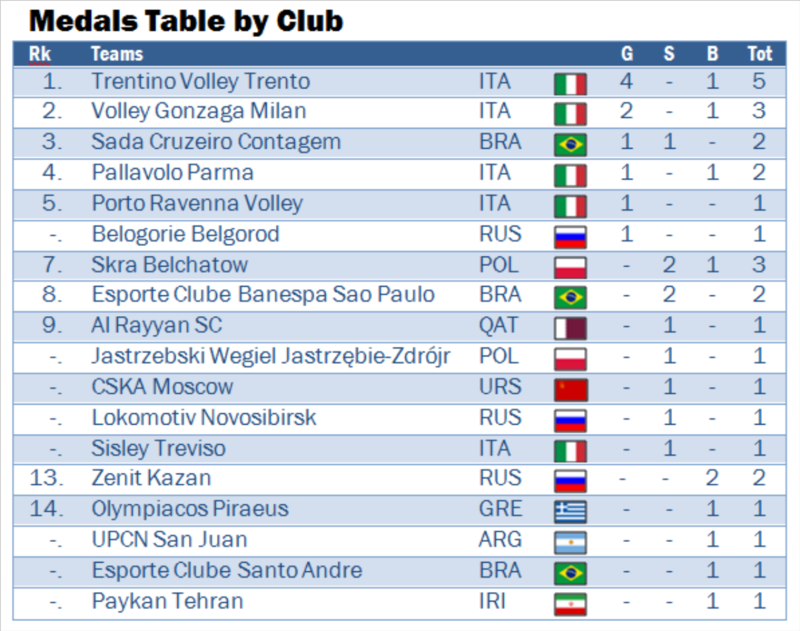 Aside from Trentino, only Volley Gonzaga have multiple golds. They won the trophy in 1990 (as Mediolanum) at home in Milan 3-0 (15-8, 15-10, 15-7) over Banespa Sao Paolo and again in 1992 (as Misura) in Treviso 3-2 (15-7, 12-15, 9-15, 15-7, 15-7) over the home team of Sisley. This year there are no representatives from Italy to try and claim back the title. So will it be Zenit Kazan keeping the title in Russia (after the success of Belogorie Belgorod last year)? Or will Sada Cruzeiro take advantage of home crowd support to bring the trophy back to Brazil and become only the third club with multiple gold medals? Or can any of the other contenders rise up to upset the favourites? 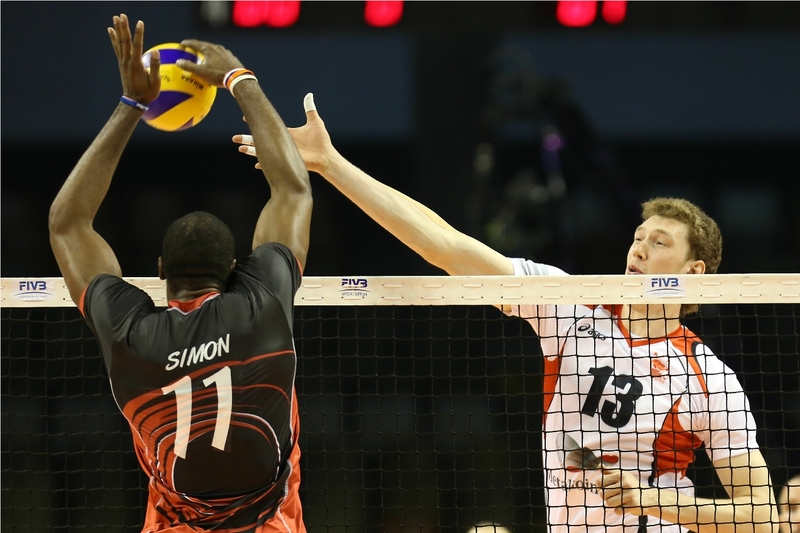 The official competition website will have all the latest from the 2015 edition of the FIVB Volleyball Men's Club World Championship, including match reports, live match text commentary, statistics, photographs and highlights from social media. Dmitriy Muserskiy of Belogorie spreads out one hand to try and stop Al-Rayyan's Robertlandy Simon in the 2014 final at Belo Horizonte's Mineirinho.